Aquarius is a special purpose ship of 77 meters length, built in 1977 and managed and owned by the shipping company Jasmund Shipping. The ship is chartered by SOS MEDITERRANEE in partnership with MSF. Aquarius is operating in the Central Mediterranean since February 2016 and has assisted more than 29 000 people in distress at sea. Download here the history of rescue and transfer operations. The Aquarius is temporarily registered by the Liberian Maritime Authority for administrative reasons. MSF started its search and rescue activities in 2015 after the Italian Search and Rescue operation called „Mare Nostrum“ was terminated. MSF provides medical assistance to people affected by conflict, epidemics, disasters, or exclusion from healthcare. MSF teams are made up of tens of thousands of health professionals, logistics and administrative staff – bound together by a common charter. MSF‘s actions are guided by medical ethics and the principles of impartiality, independence, and neutrality. We are a non-profit, self-governed, member-based organization. – MSF provides assistance to populations in distress, to victims of natural or man-made disasters and to victims of armed conflict. They do so irrespective of race, religion, creed or political convictions. – MSF observes neutrality and impartiality in the name of universal medical ethics and the right to humanitarian assistance and claims full and unhindered freedom in the exercise of its functions. – Members undertake to respect their professional code of ethics and maintain complete independence from all political, economic or religious powers. 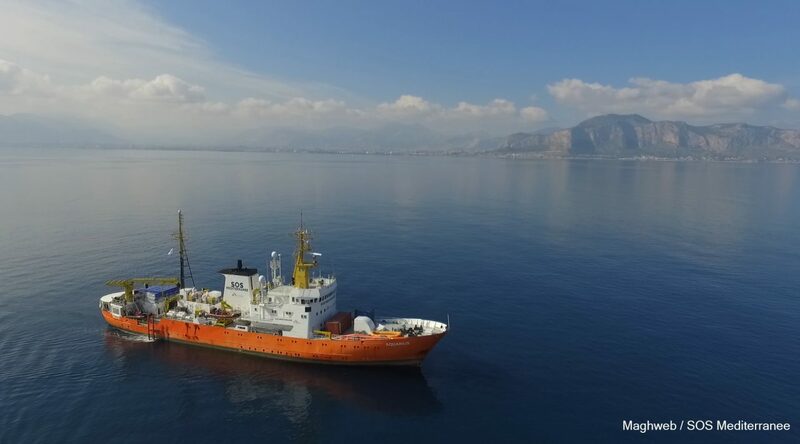 SOS MEDITERRANEE works as a European association with teams in Germany, France, Italy and Switzerland in a European network, jointly financing and operating the rescue ship Aquarius, which has been in continuous operation since February 2016 in international waters between Italy and Libya. The medical care has been provided by Doctors without Borders since May 2016. – Saving lives: Rescuing people from distress at sea and providing emergency medical treatment on board. – Protect and assist: Medical and psychological care of the refugees on board and connecting to supporting institutions in Europe. – Testify: Give the rescued a voice. Show the many faces of the migration. Inform the European public about the situation of refugees in the Mediterranean and commemorate those that never arrived. SOS MEDITERRANEE is based on the respect for human beings and their dignity, without partiality as concerns their nationality or origin, their social belonging, religious belief, political position or ethnic identity. Faced with repeated shipwrecks of migrants and refugees trying to cross the Mediterranean Sea in order to reach Europe, considering that there is no adequate rescue mission in the Mediterranean Sea to help migrants and refugees in distress in an efficient, appropriate and lasting manner. As citizens convinced that human rights apply to everyone, we are calling for a large-scale mobilization based on civil society coming together to save migrants in the Mediterranean Sea.